The popular hand woven Banarasi silk sari from Varanasi has passed the test of time through centuries. But the import of cheap Chinese silk and introduction of power loom pose immense threat. That the obsession for Banarasi silk sari (traditional Indian wear for women) is not limited to Indians was evident when US first lady Michelle Obama, who accompanied President Barack Obama for India’s Republic Day last January, was gifted a hand-woven Banarasi silk sari that took three weavers three months to complete. The cream-coloured sari weighed nearly 400 grams and estimated to cost INR150,000 (EUR 2100). Known for its design, brocade, pattern and bright colours, Banarasi silk from the religious city of Varanasi, Uttar Pradesh, is one of the most sought out silk fabrics in India. The art that obtained its Geographical Indication (GI) recognition, a proof of authentic origin, in 2009 gets tough competition from its counterparts such as Kanchipuram (Tamil Nadu) and Surat Silk (Gujarat). 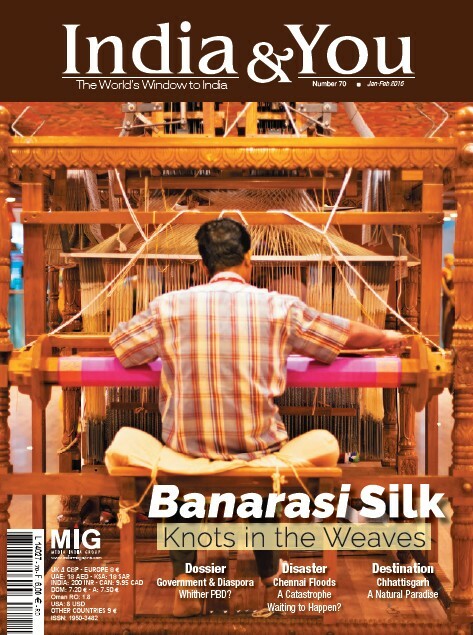 Of the Indian silk industry that accounts for the 15 pc of the global output, the Varanasi hand-woven silk industry is itself worth around EUR 73 million, including EUR 19 million in exports. Apart from feeding Michelle Obama’s fascination for Banarasi silk sari, the gesture was also meant to seek the attention of world towards the handloom weavers for their finesse and colourful designs, says local businessman Abdul Matin, whose family has been in handloom weaving business for the last three generations. Another Banaras based businessman, Bharat Shah, whose family too has been involved in the fabric trade from the city for three generations, says, “From INR 30 billion, nearly seven to eight years ago, the turnover of hand-woven Banarasi Silk has reduced to INR 5-7 billion.” Of the total INR 80-100 billion turnover now, Banarasi Silk only accounts for 15 pc, informs Shah. Both Matin’s and Shah’s concerns for the handloom weavers deal today with an urgent threat. While Banarasi sari may be exquisite and admired, the craftsmen fear that the industry may be hanging by a thread in the presence of the mass produced garments, the Chinese competition, that accounts for 82 pc of the global silk output, and the new trend of power loom. The misery began when India lifted the ban on the import of silk in 2001 and cheap Chinese silk was dumped in abundance in Banaras. Added to this the power loom, and thus initiated the market for imitation fabric that comprises of the 85 pc of the Banaras textile industry today. As the product was exact copy of Banarasi silk, cheaper and abundantly available for the masses, it caused immense dent to the Banarasi silk. While the difference between a real hand woven and imitation is hard to tell, the variation in price is steep. A sari from power loom, for instance, may cost between the INR 600-4000, a handloom product begins with INR 3000 and goes up to a few hundred thousand depending on the material and design. An original Banarasi tissue sari handwoven with silver or gold zari (threadwork) may cost as much as INR 100,000 or more. This naturally affected the sale and market. 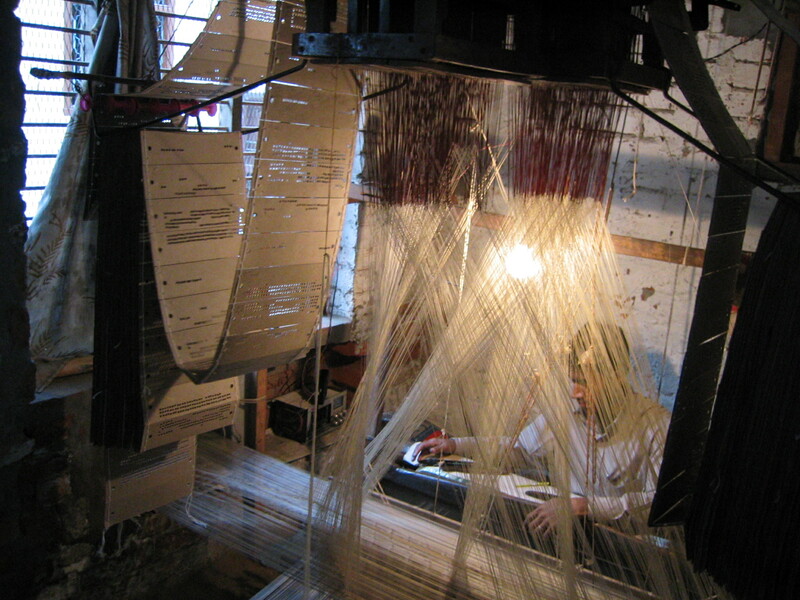 The weavers too drifted from the art, seeing the advantages of power loom. For Banarasi silk that was, as says the legend, wrapped around Gautam Buddhha when he died, such threat is appalling.